Not just your standard hiking route....For the average Munro Bagger this definitely is a different league. 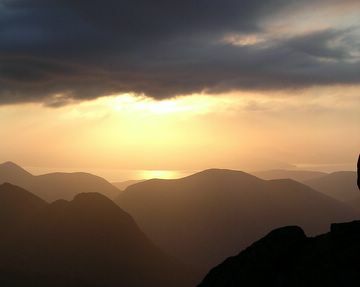 The Cuillin Ridge offers the most challenging mountaineering environment available in the British Isles. It is like a maze of twists and turns, climbs and descents that amaze and bewilder. The exposure is incredible, vast yawning expanses of emptiness either side of you. So why bother? Because the views from the Cuillins are incredible, the scrambling and climbing is exhilarating and the ridge will push your mountaineering skill to their limit, even the rock climbers amongst us will feel satisfied spending time on these dizzy heights. There really is nothing else like it to compare in the UK. Latch onto others if they seem to know the route! Psychologically the dramatic beauty of the ridge is implanted forever. Height climbed approx 13,500 ft / 4115 m, climbing 68 tops in all!